3 Bedroom Semi Detached Bungalow For Sale in Liverpool for Offers Over £230,000. 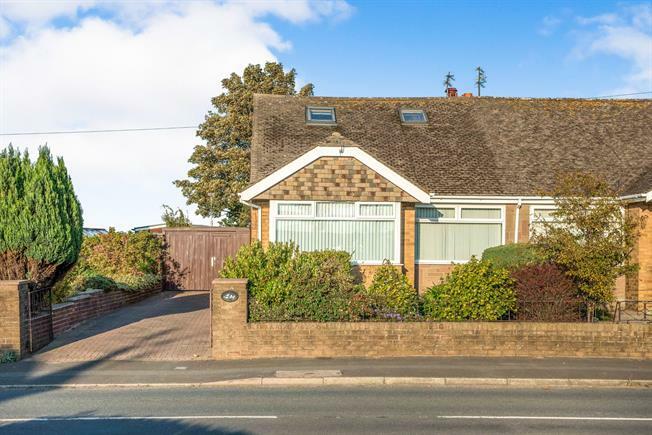 A three bedroom semi detached dormer bungalow in the popular semi-rural suburb of Ince Blundell, within each reach of Crosby and Formby village with an array of local amenities. The accommodation briefly comprises: lounge, conservatory, kitchen, shower room, two bedrooms to the ground floor and one bedroom and en-suite to the first floor. Driveway leads to the single garage with attached summer house. Entrance porch, stairs to the landing. French doors lead into the conservatory, radiator, Cast Iron multi-fuel stove. UPVC double glazed window to the side, tiled floor and a range of wall and floor mounted kitchen units with complementing work surfaces, inset sink unit with drainer, housing for cooker, washing machine and dryer. UPVC double glazed window, radiator, tiled flooring. Currently used as a dining room with UPVC double glazed bay window to the front and radiator. Currently used as a study with UPVC double glazed window and radiator. Modern three piece bathroom suite in white comprising WC, wash hand basin and double shower. UPVC double glazed window, radiator and store cupboard. Two UPVC double glazed windows to the rear, radiator. Double glazed Velux window, vinyl floor, WC, wash hand basin and shower. Driveway to the front leads down the side of the property to the single garage. The generous rear garden benefits from a private aspect with mature shrubs and trees and a summer house is attached to the garage.